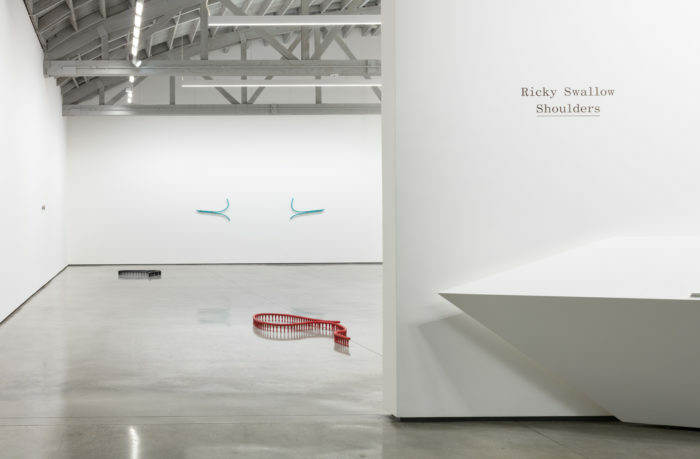 David Kordansky Gallery is pleased to present Shoulders, an exhibition of new sculptures by Ricky Swallow. The show will open on November 2 and remain on view through December 15, 2018. An opening reception will take place on Friday, November 2 from 6:00pm until 8:00pm. 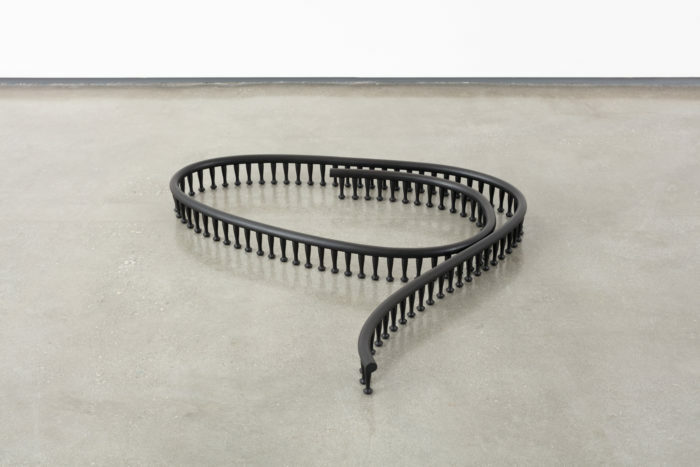 Including several works that represent a dramatic increase in scale for the artist, Shoulders features a group of cast bronze sculptures that relate directly to the floor or walls of the gallery without the mediation of pedestals, and finds Swallow achieving new levels of both compositional and narrative complexity. 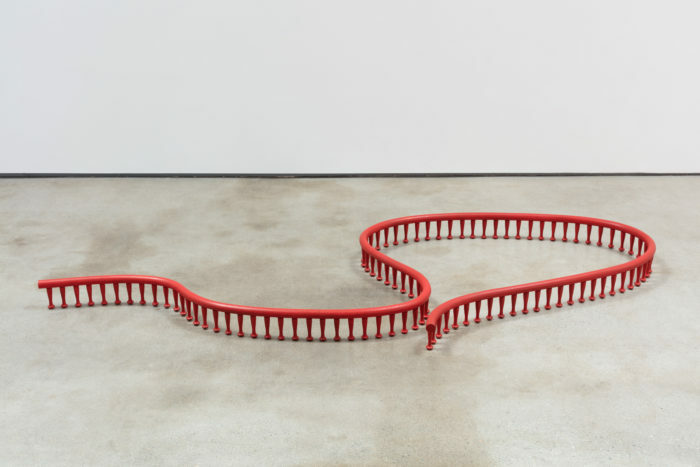 His virtuoso transformations of humble materials like rattan cane and rope, as well as his ongoing experiments with groups of recurring forms, are accompanied by additions to his vocabulary that augment the work’s surrealism and further hone its engineered poise. For all their precision, the sculptures always point back to Swallow’s hands-on processes in the studio and foundry, fusing craft and conception–and hand and eye–in mysterious ways. 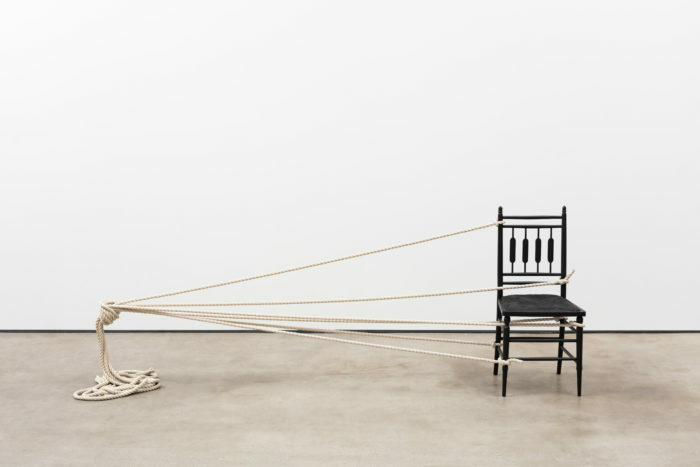 A major new work combines two elements: bronze casts of a chair and a group of braided ropes are combined to create a sculptural scene of marked tension and paradoxical balance. 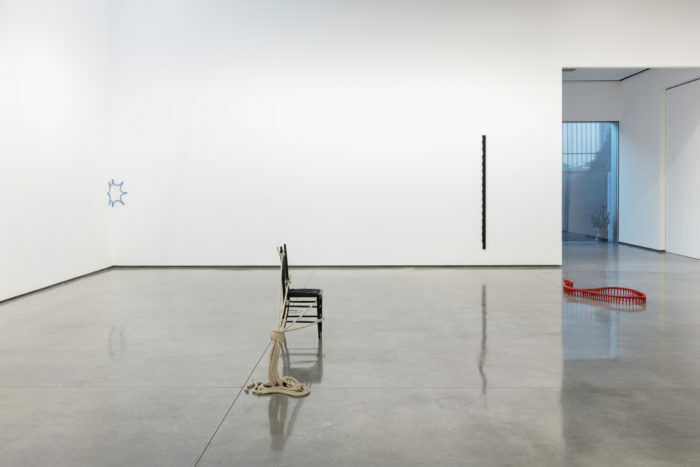 While various chair motifs have been present in Swallow’s work over the last few years, here the black-patinated chair has been cast from an actual, readymade object. 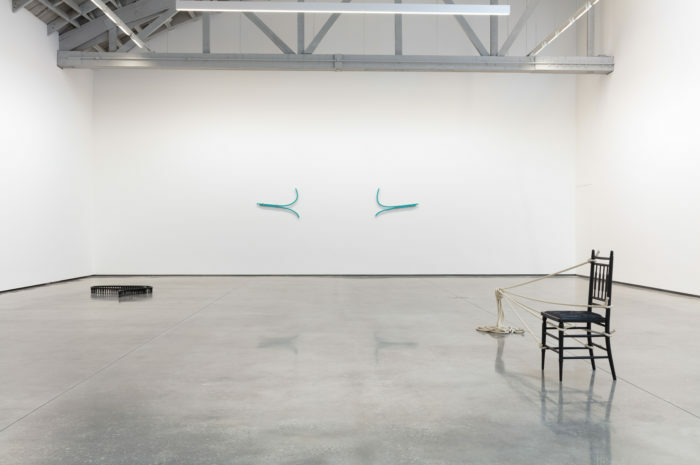 The rope forms, painted white, extend more than six feet to its side, creating a permanent, three-dimensional version of a perspectival diagram; they end in a large knot that hangs suspended in space. 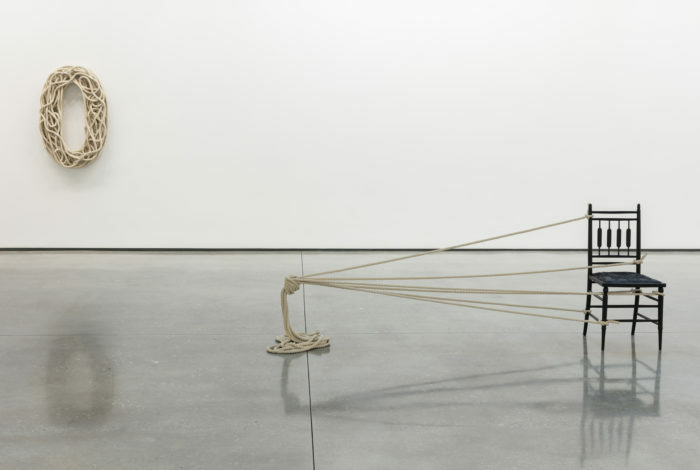 The arrangement appears to defy the laws of gravity, but the ropes, made of bronze, hold themselves up by their own ends, which coil onto the floor. Conjuring stillness, solidity, and destabilization all at once, the work is one of Swallow’s most ambitious and poetically resonant to date. Its overall composition is a technical tour-de-force that is also rich in the most subtle of details. The seat of the cast chair, for instance, retains the impression of the worn floral pattern on the original chair’s cushion. 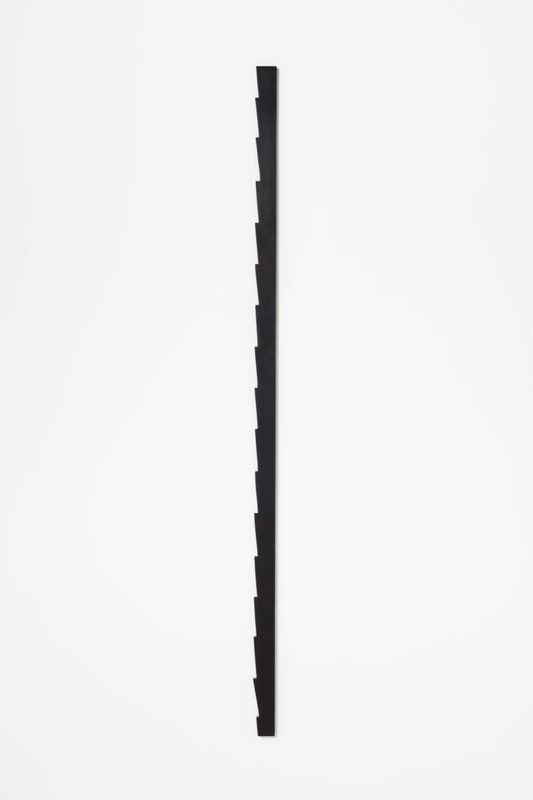 Several works in Shoulders are adorned with rows of cast wooden Shaker pegs; by employing them as repeated structural and/or visual devices, Swallow forces these remade pegs to exceed their original function, subjecting them to a new kind of serial rhythm. 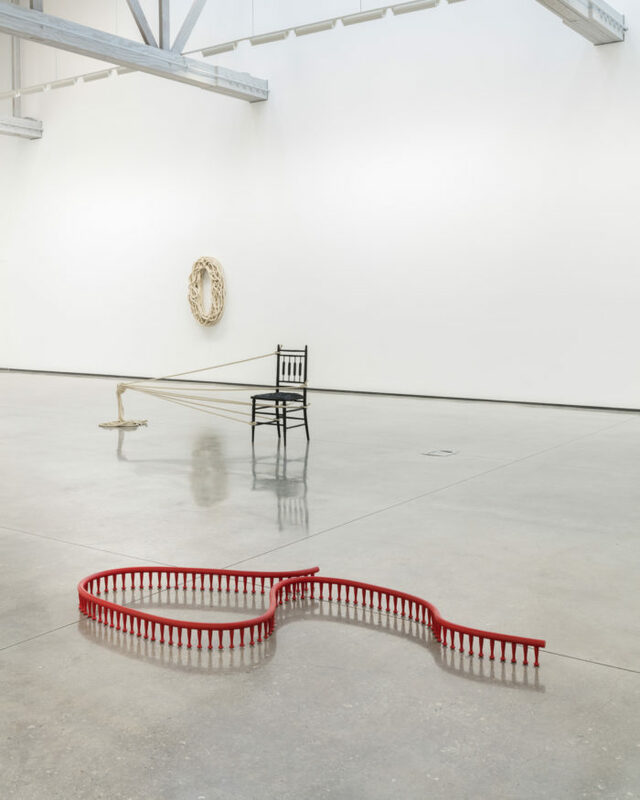 Two such sculptures are installed on the floor, with the pegs supporting snaking, tubular lengths of bronze cast from sections of rattan cane. 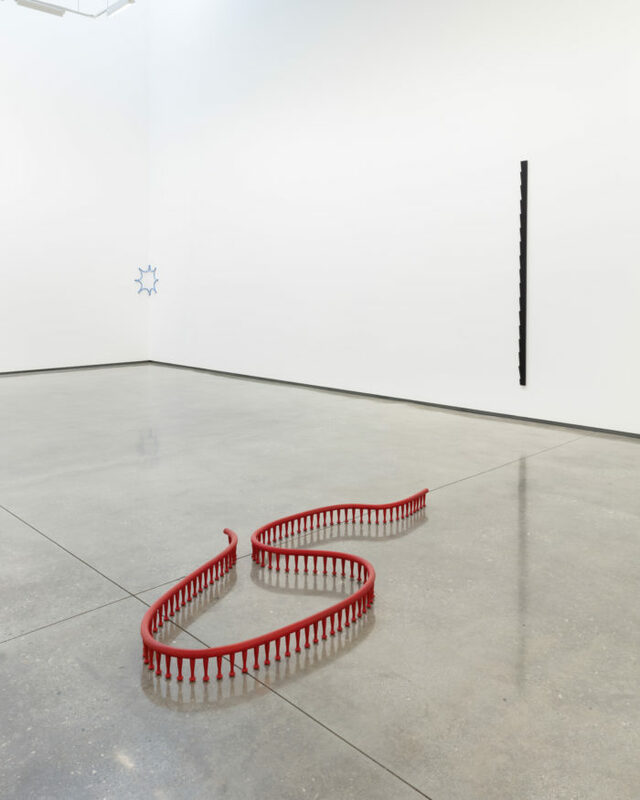 In both cases the pegs–and the works as a whole–read as neither wholly found nor wholly created, and suggest that certain discoveries and perceptual spaces can only be conjured through the physical process of making. 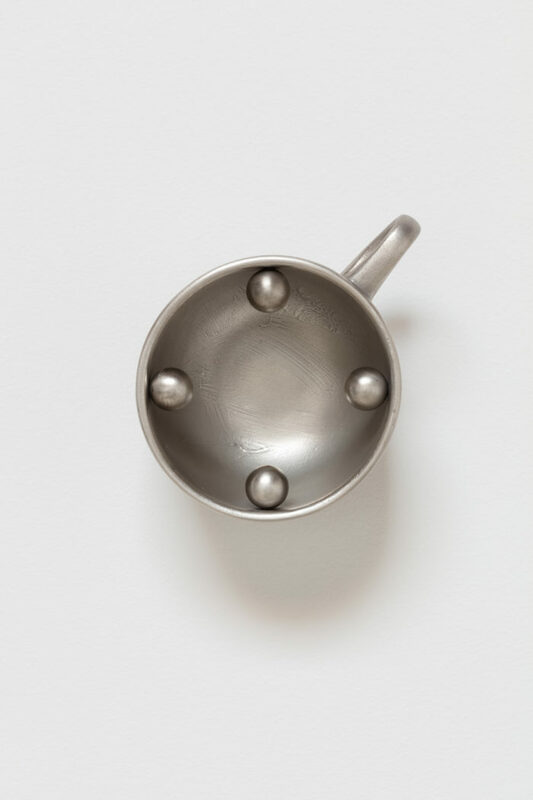 Swallow’s objects often appear as delineated graphic forms and thereby maintain charged relationships with the negative space around them. 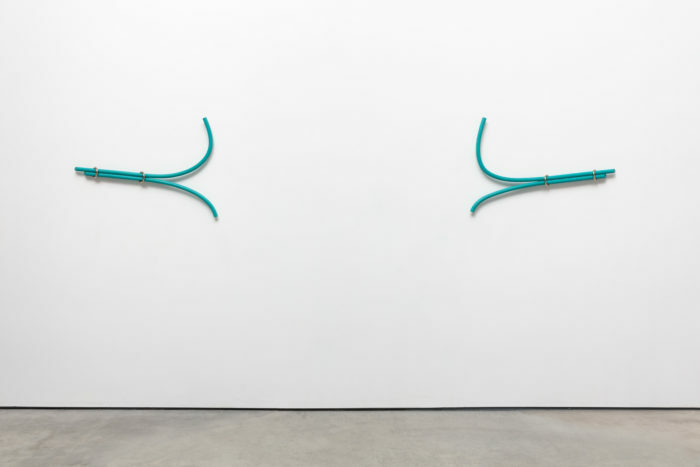 A two-part wall-based work, for instance, incorporates casts of bent cane patinated a greenish blue; it activates the gallery’s architecture in ways that are as painterly as they are sculptural. Each part consists of two curving linear forms bound together with polished bronze rings and resembles a bird-like “V” turned on its side (or even a stylized eye), while the rings break with illusion and reveal the surface of the bronze in something akin to its pure form. 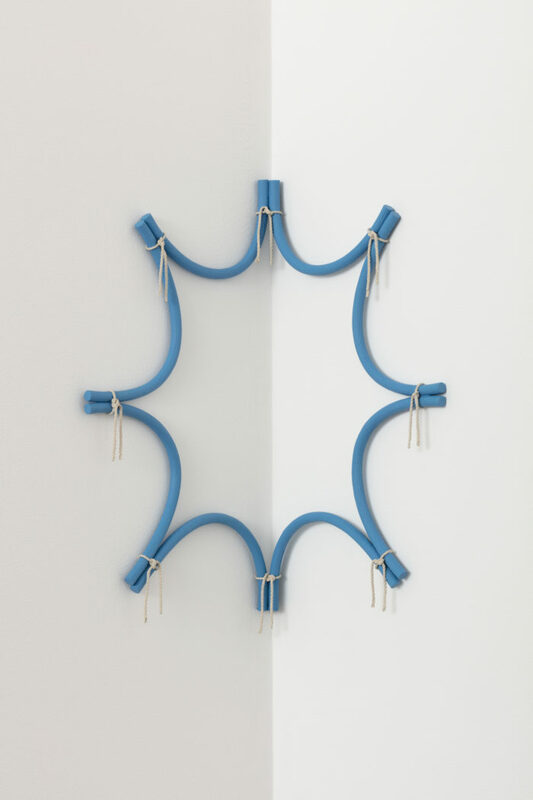 With the parts hung separated from one another by several feet, they seem to repel and attract each other in equal measure. The entire wall becomes a ground for the interplay of material, picture, flatness, and depth. 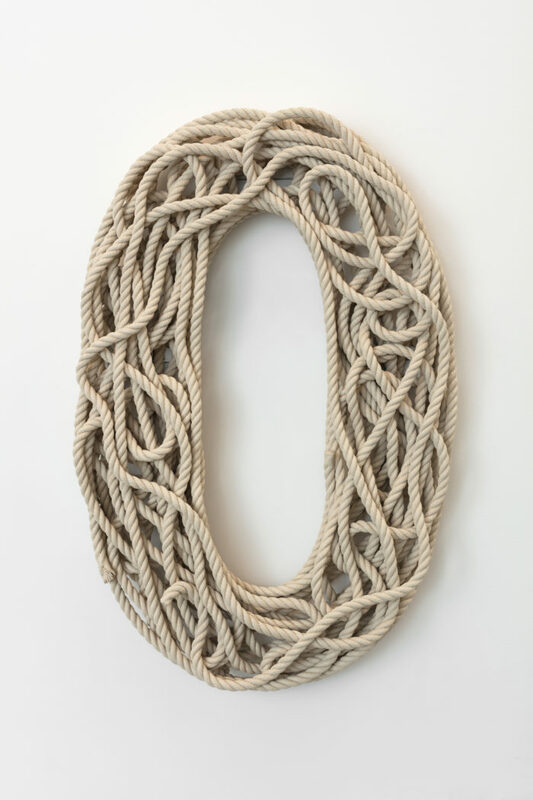 In another wall-based sculpture, Swallow uses an enlarged version of a recurring shape–a “O” or zero that has appeared in various configurations over the last few years–as a template for a new composition, over four feet tall, fabricated entirely of cast rope. 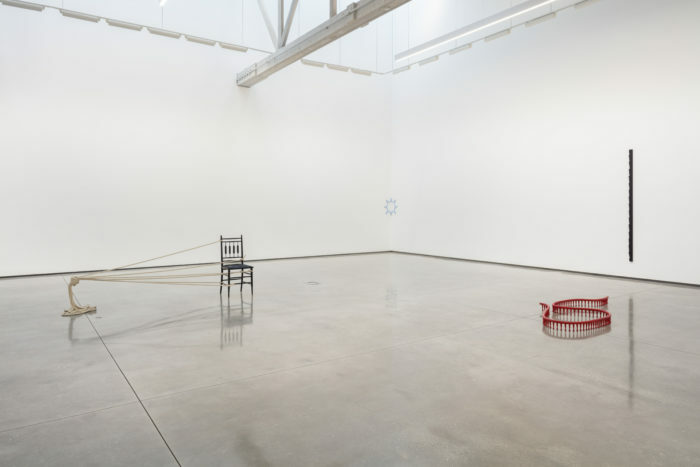 Traveling sinuously over, around, and through itself, the rope exemplifies the formal paradoxes that appear throughout the work, as well as the circularity of the procedures by which Swallow produces it. The manipulation of materials in the studio leads to puzzles that must be addressed in the foundry, which in turn prompts new experiments in the studio. While the sculptures themselves eventually exist in a finished state, they conjure this sense of constant movement and animation. Ricky Swallow (b. 1974, San Remo, Australia) has been the subject of solo and two-person exhibitions at Modern Art, London (2018); Maccarone, New York (2017); David Kordansky Gallery, Los Angeles (2015); the Huntington Library, Art Collections, and Botanical Gardens, San Marino, California, with Lesley Vance (2011); Douglas Hyde Gallery, Dublin (2007); Kunsthalle Wien (2007); MoMA PS1, Long Island City, New York (2006); and the Australian Pavilion, 51st Venice Biennale (2005). Recent group exhibitions include 99 Cents or Less, Museum of Contemporary Art Detroit (2017); L’esprit du Bauhaus, l’objet en question, Les Arts Décoratifs, Paris (2016); Made in L.A. 2014, Hammer Museum, Los Angeles (2014); 2014 Whitney Biennial, Whitney Museum of American Art, New York (2014); Quiz: Sur une idée de Robert Stadler, Ensemble Poirel-Nancy, Paris (2014); and Sculptors Drawing, Aspen Art Museum, Colorado (2010). A limited-edition book of his recent work, SKEWS +, was published in 2016. Swallow lives and works in Los Angeles. © David Kordansky, Los Angeles, CALIFORNIA U.S.A.